It is now August, and the end of another successful ball season is upon us. After hosting our third (count’em… 3!) and final AA provincial championship tournament this past weekend, I am left sorting through a jumble of mixed emotions. Relief, that all the work is finally coming to a temporary close. Sadness, that our time on the diamonds with our kids, watching them fail and learn and grow and succeed, is over. Happiness, for those successes that were realized and for the potential we take into the future. Pride, in the work done by those parents, coaches and athletes here in Barrhead and also those communities, our partners, around us. While every year brings with it a different set of challenges and failures from which we can and will learn, for this brief post I wish only to tell a story. A story of perseverance, cooperation and sportsmanship that I feel embodies what we strive to achieve every year. 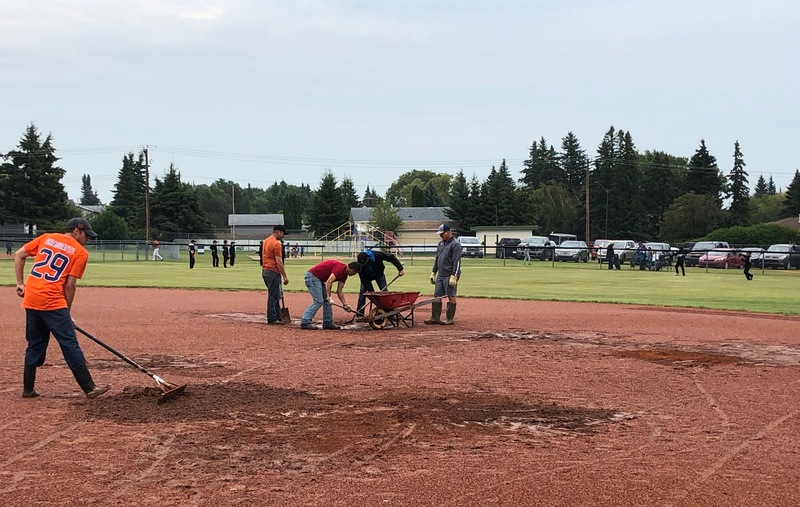 When Barrhead received over an inch of rain on the opening Friday of their Mosquito AA provincial tournament, our parents rose to the challenge to fight what, at times, was a losing and frustrating battle trying to get playable diamonds ready for the teams. We dug and we hauled and we raked and we shook our heads in despair as each break in the storm was repeatedly displaced by a seemingly endless onslaught of new water. Rivers cut trenches along our baselines, and shale turned to soup. By the end of a very long day we were running out of both sunlight and patience, and looming cancellations and postponements were shaping up to ruin the weekend for everyone. And then, like a battalion of reinforcements arriving just when the battle seems lost, the SJP Jays stepped up to the plate. They sent a group of parents to assist in our efforts to get our highest and driest diamond playable in hopes of squeezing in one more game before nightfall. After enough work had been done to make the diamond safe, they agreed to start their match with our Orioles at 7:45PM and battle right to the edge of nightfall, leaving only half an inning to make up the next day. After a late trip home to Edmonton, they then returned to Barrhead early the next morning to finish the contest at 8AM, right before the next wash of rain settled in. They ended up losing a close bases-loaded thriller to the host Orioles, but did they complain about the adversity when they rightly could have? No. They extended their hands just as they had the night before when we needed help, and they congratulated us on a good game. With the poor weather continuing into the Saturday and diamond conditions worsening, it was looking more and more like the entire day of ball would have to be canceled and pushed back to the Sunday. Even on our most tolerant and elevated diamond #2, large puddles were forming at the perimeter of the infield that our trusty shop vacs could not keep at bay. Coaches and parents traveling from hours away were looking for guidance and we were struggling to avoid that most difficult answer. Again, we thought we had lost. And again, reinforcements came, this time from the Didsbury Jets and Beaumont BoSox. They marched out into the rain, shook hands, and proceeded to play in what was probably Barrhead’s first baseball mud-bowl in a long time. Pitches left fine contrails of smashed raindrops in their wake. Ground balls sent puddles into the air like geysers. And by the end, everybody wore the same shade of shale red on their uniforms and faces. And finally, as if beaten once and for all by the defiant effort of the Jets and BoSox, the rain began to subside. The Mosquitoes were able to finish half their round robin games on that Saturday following the example set by the Jets and BoSox, leaving the other half for Sunday morning. In the end, after nearly two days of rain, only the Championship Final match had to be pushed to Monday, meaning only two of the eight teams participating had to be further inconvenienced as a result of the horrible weather. When all was said and done, only two teams made it to that Championship Final, but all of the teams present this past weekend exhibited the characteristics of true champions when it mattered most… when things were difficult, and hope was thin… and for that I want to extend my most heartfelt thanks. To cap it all off, I would like to share one of the emails we received following our final provincial tournament. This one was sent by Brad Blatz with the Didsbury Jets who, in an ultimate display of class and sportsmanship, does an excellent job of summarizing why it is we sometimes stand in the rain with shovels, hoping to make a difference. On behalf of the Didsbury Jets and the Didsbury Minor Baseball Association, I want to congratulate you on a tremendous job hosting Provincials and thank you for all the extra effort that made this past weekend possible. Obviously, the weather created some huge challenges, but you and your crew did a great job managing through it and ensuring everything was safe, fair, and enjoyable for the kids. It is often a thankless job, so I wanted to be sure to pass on our appreciation. Our boys had a terrific time and I’m sure their experience in Barrhead will remain with them forever. Please pass this message on to anyone you see fit. Thanks again to all of our parents, coaches, managers, local business owners and other volunteers and sponsors for their priceless contributions this year. Without you, we would be nothing.